In 2011 sluiten de sociale partners en de Brusselse regering de New Deal, die ertoe strekt het Brusselse tewerkstellingsbeleid coherenter te maken door middel van partnerschappen tussen de betrokken particuliere en openbare actoren. De evaluatie van dat overheidsbeleid is een primeur in het Brussels Hoofdstedelijk Gewest. Het artikel analyseert de conclusies van de evaluatie die werden verkregen via casestudy’s en focusgroepen. Het maakt een operationele balans op van de opgezette coördinatiemechanismen volgens het standpunt van de actoren die betrokken zijn bij de New Deal: wijzen die nieuwe samenwerkingsvormen op het opkomen van een nieuwe vorm van public governance in het Brussels Gewest? Het artikel toont aan dat de veranderingen die de New Deal wil doorvoeren in de governance tussen de Brusselse actoren, gekenmerkt worden door het streven naar transversaliteit van het overheidsbeleid, maar uiteindelijk beperkt worden door de institutionele versnippering die het Pact wil doorbreken. De coördinatiemethode, die te informeel is en te veel afhangt van de actoren, zou versterkt moeten worden om de duurzaamheid van de aanpak te waarborgen en te vermijden dat de coördinatie beperkt blijft tot het louter samenbrengen van actoren. 1On 29 April 2011, when the Minister-President, Ministers of the Environment, Economy and Employment of the Brussels-Capital Region and social partners from the Conseil économique et social bruxellois (CESRBC) signed the “Pacte de Croissance Urbaine Durable”1 (sustainable urban growth agreement), also referred to as the “Brussels New Deal”, their aim was to reinforce the coherence of public intervention through partnerships between various types of private or public stakeholder with little or no experience working together. 2The reinforcement of the coordination between these various partners is not an end in itself: it must allow a clarification of the interpretation of the employment policy in the territory of the Brussels Region, for job seekers as well as for companies wishing to recruit workers. In this territory, the competences in the area of employment and training are distributed between various administrative entities: each stakeholder intervenes in a specific manner, according to its field of competence. This division is considered by these signatories to be an obstacle to the employment of the Brussels residents. 3From the start, the signatories of the agreement had decided that the New Deal would be evaluated by BISA (Brussels Institute for Statistics and Analysis) before the end of the 2009‑2014 legislature. This type of transversal evaluation centred on the competences of several administrative entities was a first in the Brussels-Capital Region. It also led to the internalisation of the evaluative practice within the administration, by extending the competences of BISA to the evaluation of public policies. 4The objective of this evaluation was to take stock of the functioning of coordination mechanisms implemented in the transversal interventions of the Brussels New Deal, according to the point of view of stakeholders involved in its implementation. The results, accompanied by specific recommendations to improve the implementation of this new Brussels partnership policy, are detailed in BISA Cahier No. 4. The fact that this exercise was carried out only two years after the signature of the New Deal, meant that the effects of the partnerships were not able to be evaluated, in terms of the insertion of the Brussels residents in the labour market. 5This article highlights the characteristics of the coordination processes used in the transversal section of the New Deal and analyses their innovation potential in the area of employment and professional training policy. It includes four parts. After a presentation of the Brussels New Deal and its governance arrangements, the second part of this article deals with the research strategy and theoretical framework chosen to propose a detailed answer to the evaluative questions. The third part describes the main results of this evaluation. 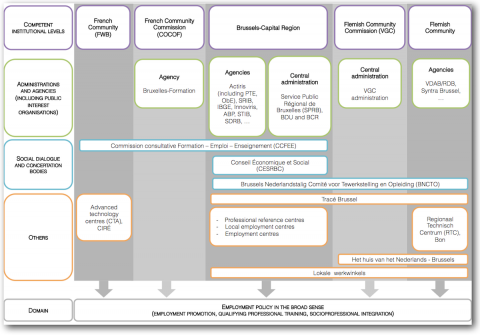 The fourth part answers the question as to the effectiveness of these coordination processes, which is based on the fact that the establishment of partnerships allows a modification of the method of cooperation between the stakeholders concerned, as well as their contribution to more coherent public intervention in the area of support for the employment of the Brussels residents. In conclusion, the contributions and limitations of the coordination mechanisms within the New Deal which result from this transversal evaluation are discussed. 6As with all evaluations of public policy, the first task for evaluators was to analyse the policy being evaluated. This section examines the intervention logic of the transversal section of the New Deal, and identifies the anticipated effects. 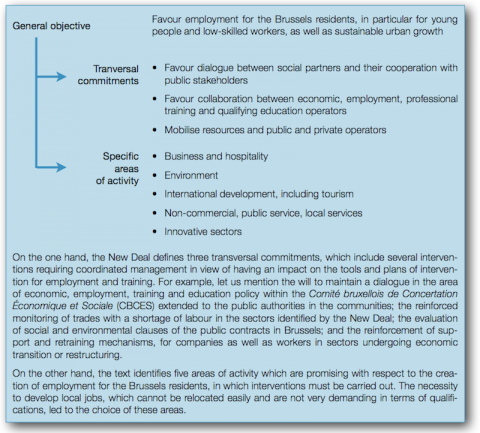 7The agreement is aimed at favouring access to employment for the Brussels residents and at ensuring sustainable urban growth. It thus defines interventions to be implemented within the framework of partnerships between stakeholders in Brussels, aimed at more interconnected, coherent and complementary employment and training policies in the territory of Brussels. 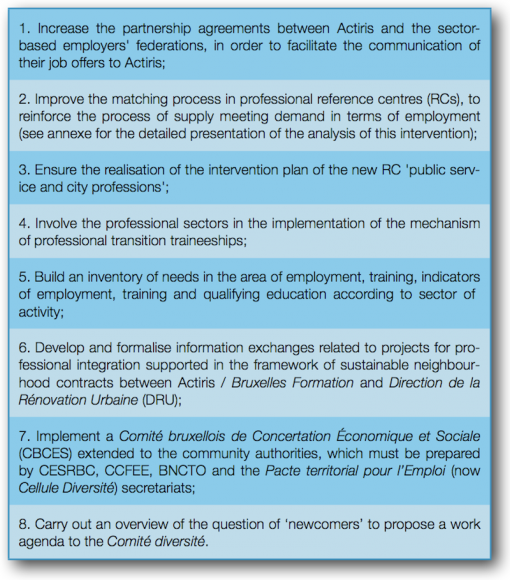 8The New Deal is defined by its signatories as a coordination instrument aimed at improving public tools. It thus constitutes a framework in which the partnerships between stakeholders of different types may be formed: regional and/or community administrations, social dialogue and concertation bodies, ministers offices, social and professional integration stakeholders, etc. “The challenge is to give greater legitimacy to work conducted within a partnership […], by showing that joint intervention leads to better success” [Thys, 2009]. 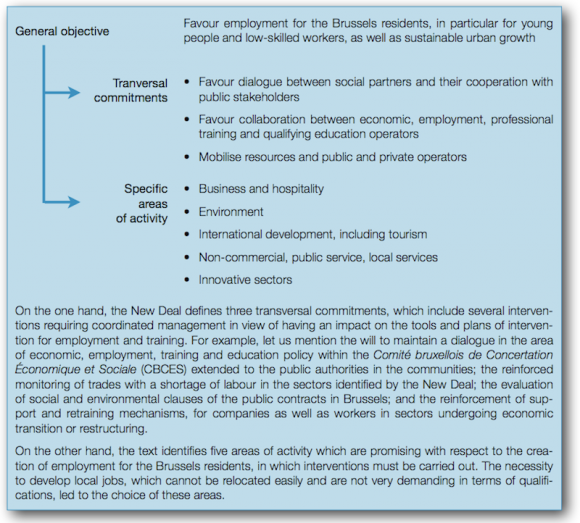 This involves developing a shared vision of public intervention and coordinating interventions in order to favour access to employment for the Brussels residents. The New Deal is therefore aimed at organising network-based governance and at considering employment policy well beyond the regional scope. 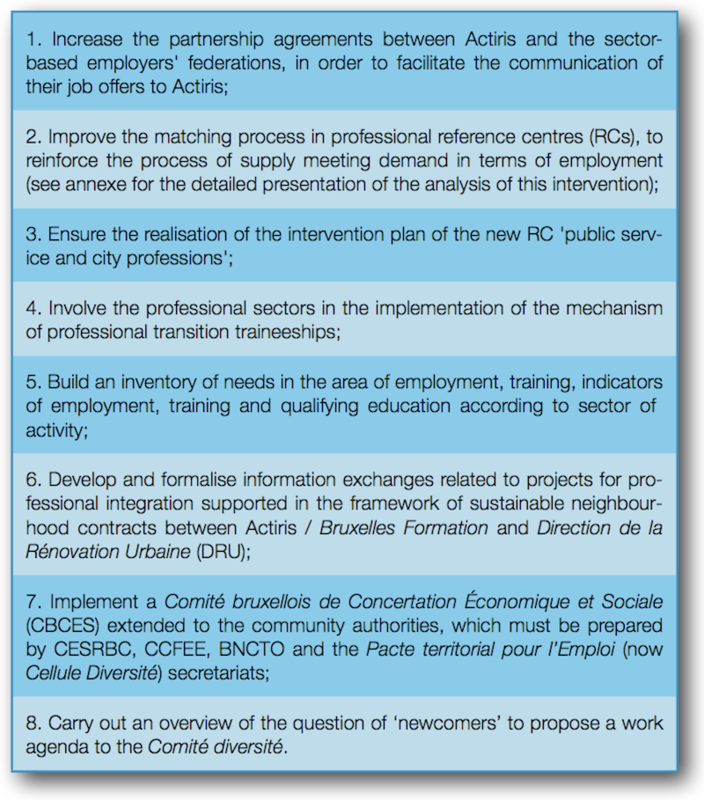 9The actions to be implemented in the New Deal are divided into two sections (box 1). The first transversal section is centred on three common transversal commitments. The second section is based on actions to be carried out in five specific areas of activity. 10While the partnership approach is far from being new, the commitments of the New Deal are aimed at establishing long-term development. In this perspective, the signatories have not set any deadlines. The New Deal was elaborated in the spirit of open coordination, without defining any concrete actions to be implemented, and instead sets guidelines and specifies the correct procedure and working method for the stakeholders involved, in order to define these actions and carry them out. The initiative is therefore based on a joint effort between stakeholders associated within a partnership with no hierarchical organisation, and whose dynamics are based on a logic of cooperation. 11While the New Deal follows other instruments implemented in the Brussels Region, namely the Pacte Social pour l’Emploi (2002) and the Contrat pour l’Economie et l’Emploi (2005), it differs from them as regards its method of governance. Its aim is to reinforce social dialogue2 in a perspective of the tripartite management (unions, employers and Brussels government) of employment in the broad sense: the social partners are involved in the same way as the government in the elaboration of the agreement and, for the first time, in its implementation. 12The transversal mobilisation of all of the organisations involved in employment in Brussels and for the Brussels residents, which was the intention since the launch of the New Deal, did not take place. Since the start of the implementation, many socio-economic institutional stakeholders have not participated in the dynamics of the partnerships formed as part of the transversal section of the New Deal, whether it involves SDRB, Port of Brussels, SRIB, STIB, SAF, ABE, ABEA,3 etc. The signatories very quickly refocused the New Deal on a limited number of central public stakeholders in the area of employment policy and training, such as Actiris, Bruxelles Formation, VDAB-RDB and the professional reference centres. 13All strategic decisions of the New Deal are made jointly by the government, employers and unions and are ratified by the Comité bruxellois de Concertation Économique et Sociale (CBCES), made up of social partners and the Brussels government (figure 1). 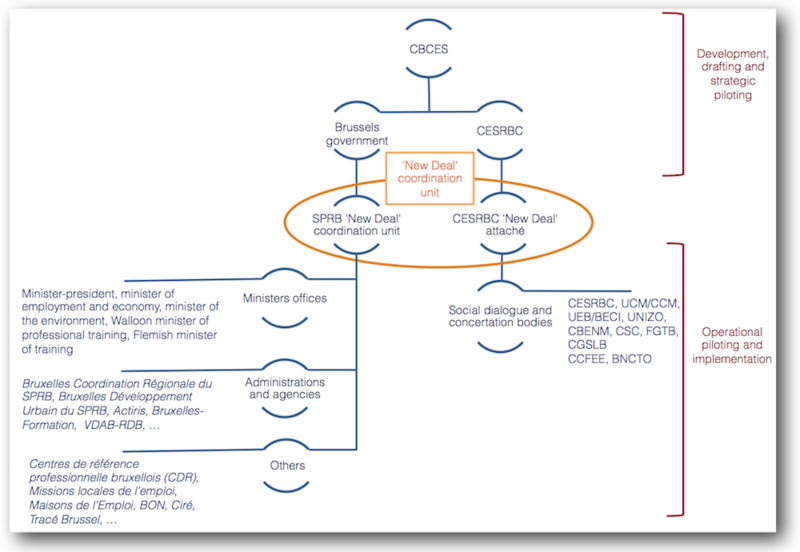 Abbreviations: Actiris: Office régional bruxellois de l’emploi; BNCTO: Comité Néerlandophone Bruxellois pour l’Emploi et la Formation; BON: Brussels Onthaalbureau voor inburgering; CBCES: Comité bruxellois de concertation économique et sociale; CBENM: Confédération Bruxelloise des Entreprises Non-Marchandes; CCFEE: Commission Consultative Formation-Emploi-Enseignement; CESRBC: Conseil économique et social de la Région Bruxelles-Capitale; CGSLB: Centrale générale des syndicats libéraux de Belgique; CIRÉ: Coordination et initiatives pour réfugiés et étrangers; CSC: Confédération des syndicats chrétiens; FGTB: Fédération Générale du Travail de Belgique; SPRB: Service public régional de Bruxelles (nouvelle dénomination du Ministère de la Région de Bruxelles-Capitale); UCM/CCM: Union des Classes Moyennes; UEB/BECI: Chambre de Commerce & Union des Entreprises de Bruxelles; UNIZO: Unie van Zelfstandige Ondernemers; VDAB-Brussel/ VDAB-RDB: Vlaams Dienst voor Arbeidsbemiddeling en Beroepsopleiding, Regionale Dienst Brussel. 14In its operational section, the New Deal involves various organisations (figure 1) in addition to its creators. Each intervention is organised under the responsibility of a “pilot” in charge of operational management, with the support of a dedicated working group, providing an opportunity to create synergies between the partners. Another original aspect of the New Deal is the involvement of traditional strategic stakeholders, ministers offices and social partners in the implementation and management of interventions. Finally, the agreement provides for a coordination unit, which acts as a link between the operational and strategic levels. It is made up of a person in the Brussels administration (Service public régional de Bruxelles) and a person in the CESRBC secretariat. 5 For further contextual information, see BISA, Cipriano et al., 2012. 15The overall objective of the agreement is the result of observations made in 2010 (which are still valid today) regarding the fact that just over half of workers in Brussels do not live in the Region, and make the commute from elsewhere in Belgium. In 2010, there were approximately 680 000 jobs in the territory of the capital,4 i.e. 15% of the national total.5 However, only 50.7% of these jobs were held by Brussels residents. 16At the same time, the Brussels Region has a very high unemployment rate. In 2010, this rate reached 19.9% in the Brussels Region, while it was 6.9% in the Flemish Region and 15.7% in the Walloon Region. Furthermore, the Region includes categories of people who are more vulnerable on the labour market. It is in particular characterised by a significant proportion of low-skilled unemployed people [Senhadji, 2014]. 17Furthermore, like other big European cities, the Brussels Region is a major economic hub. It produced close to 19% of the GDP in 2010. However, this wealth does not benefit the residents of the city: in 2010, the total available income of residents of the Region represented 9.5% of the total national income [BISA, Michiels, 2014]. 18These observations have been publicised widely in the studies carried out by the academic community, associations and citizens in the framework of the Citizens’ Forum of Brussels, which was held at the end of 2008 and beginning of 2009 [Vandermotten et al., 2009]. “The signature […] of the agreement […] is in keeping with the logic of the Citizens’ Forum” [Nassaux, 2011]. The drafting and the adoption of the New Deal took place in this context, where debates on the identity of Brussels and a reflection on the major challenges specific to the Brussels Region emerge. 19At institutional level, when the New Deal was signed in 2011, the Belgian federal state was competent in the area of social security and partly in the area of employment policy [Franssen et al., 2014]. In the territory of the Brussels-Capital Region, the professional training policies fall within the competence of the French Community Commission and the Flemish Community. Qualifying education falls within the competence of the community. The placement of workers, programmes for the reemployment of job seekers and standards concerning foreign workers are within the remit of the regional authorities [Nassaux, 2012]. Most of the time, the responsibilities of these institutions overlap, without a hierarchical organisation of the centres for coordination and intervention [Simoulin, 2003]. 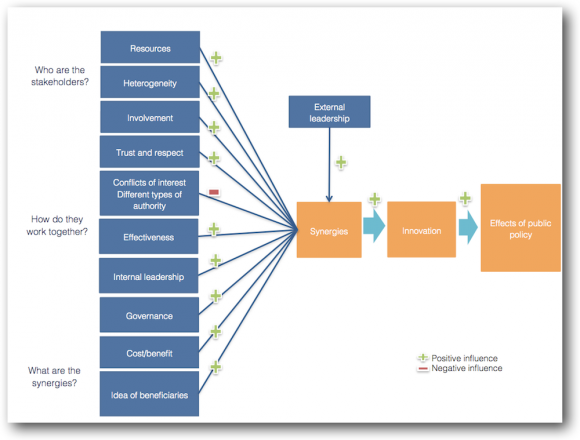 20In Brussels, this situation creates a fragmented institutional landscape whereby each entity manages its interventions in an autonomous manner and develops its own intervention logic [Hertting et al., 2012] (figure 2). “The coordination difficulties experienced by stakeholders in the area of employment, training and education are all the more significant since these stakeholders are part of a fragmented and compartmentalised institutional landscape. [This institutional framework] limits the possibilities for transversality” [Franssen et al., 2014] and the organisation of partnerships between stakeholders. Although “the stakeholders in Brussels agree with the observation that the institutional complexity and multiple levels of authority in a relatively small territory require a coordination of interventions […], this logic often remains random and fragile” [Thys, 2009]. The classification by VDAB and Syntra in the Flemish Community is carried out with respect to the list of public institutional units according to SEC 95, elaborated and updated yearly by the Banque Nationale de Belgique, in collaboration with the group of experts for the general document base. 21At political level, the signature of the New Deal took place in parallel with the start of negotiations regarding the sixth state reform. At the time, the signatories did not want to interfere with the division of competences and lived with the institutional complexity of the Brussels-Capital Region. Governance through the development of partnerships emerged by default rather than by choice [Genard, 2009]. 22The scope of the evaluation covers the actions of the transversal section of the New Deal. 23In order to take stock of the functioning of the coordination processes provided for in the New Deal, the evaluation allowed an identification of the strengths and weaknesses of this coordination method and an assessment of their added value: were these coordination processes effective? Did they contribute to achieving greater coherence between the activities of the stakeholders involved in employment and training support policies? How do they differ from former practices and make up for coordination shortcomings, which were also highlighted by Franssen et al. ? 24The evaluation compares eight case studies (table 1), i.e. eight actions representative of the partnerships established within the New Deal, among the forty or so actions identified. The selection of cases was based on information gathered from various written sources regarding the New Deal6 and from exploratory talks with key stakeholders. Three criteria were used to select them: illustrate the various degrees of intensity in the interactions between stakeholders; reproduce the diversity of the types of organisation involved in the New Deal (ministers offices, social partners, administrations, associations, etc. ); and cover the different levels of achievement reached by the actions of the agreement. 25The case studies allowed an in-depth analysis of the activities connected to the project, the organisations involved and the context in which they take place. This is why this method in particular is recommended.7 The analysis of each case was structured based on a model elaborated by Lasker et al. and Kreuter et al. . These authors developed a theoretical framework for the study of the operational dimensions of partnerships, considering coordination as a true mechanism of social innovation rather than a management tool or an instrument of public intervention. 26The mechanism aims to favour the creation of synergies, prime mover of the creativity which emerges from the exchange of knowledge, competences and resources of stakeholders, and which allows the foundations to be laid for an integrated approach to public intervention. The establishment of conditions for cooperation requires resources and time to build relations, procedures and structures which differ from those used previously by collaborating individuals and organisations. Eleven dimensions presented in figure 3 have been analysed to reconstruct the different facets of a partnership. They have allowed the stakeholders, their cooperation method and the synergies created to be identified for each of the eight actions. This framework of interpretation of partnerships highlights the influence (positive or negative) of each dimension on the synergies created by the cooperation implemented in the framework of the New Deal. 27Once the cases were selected, they underwent a two-step analysis. 28The contextual elements and the data allowing the analysis of interactions between the stakeholders were gathered based on documentary sources (follow-up reports, minutes of meetings, notes to the government, etc.) and twenty-five semi-structured interviews carried out in February and March 2014 with the stakeholders directly concerned with the eight actions analysed: the evaluators identified three key stakeholders per intervention selected, be they administrative or political, social partners or members of civil society. For each case, the analysis began with a description of the history, the stakeholders involved and the context in which the intervention took place, for the 2011‑2014 period [Albarello, 2011]. Next, the intervention was analysed with regard to the dimensions of the partnership, listed in the theoretical framework presented in figure 3. The interested reader may consult the annexe which illustrates the empirical approach carried out for the second intervention (case) of the eight actions (cases) studied (table 1). Once this analysis was carried out for the eight case studies, the group of evaluators carried out a transversal interpretation of the actions. Based on the theoretical framework, it allowed the trends, recurrences and exceptions to be identified for each dimension, and the scope of the variations and similarities observed to be highlighted. 29The conclusions of the first transversal analysis have fuelled the themes debated during two focus groups, held in March 2014 according to the method of the Open Process Workshop developed by SPIRAL [Claisse et al., 2013]. This research technique has the advantage of allowing stakeholders to discuss and react to the results of the first phase, in order to come up with recommendations as a group. Each focus group is made up of stakeholders concerned with the intervention in various capacities, with different and even conflicting approaches. First, the evaluators present the conclusions of their analysis of how the New Deal has contributed to the area of coordination. The participants are invited to identify their own roles and the problems they have encountered as part of their commitments in an intervention of the New Deal. Then, they are asked to propose changes which they feel would improve the results of their actions and partnerships: these proposals are debated in the group and are integrated in the final report by the evaluators. This workshop was unique in that it created the conditions for a group discussion on a common process of public intervention, and was followed by an open critical discussion. 30The approach adopted involves making a new worksheet for each intervention, based on the different dimensions used as a framework to produce a transversal analysis in order to make a generalisation, as suggested below. 31Several organisations have received additional resources in the framework of the New Deal, either to implement the intervention or to coordinate the partnership related to its implementation. The commitment of people specifically appointed to coordinate these actions seems to be one of the factors for success. The necessary resources to ensure the coordination between the actions of the New Deal or within the partnerships have often been underestimated. The inequality of resources between partners quickly becomes evident. Bruxelles Formation, a key stakeholder in the area of training in the territory of Brussels, has received substantial means to increase the training offer and not to coordinate partnerships. The neighbourhood contracts programme coordinated by BDU, which already operates according to the logic of partnership and has always had a comfortable budget, has not seen an increase in its budget in order to extend the cooperation to other stakeholders. Actiris benefited from a significant reinforcement of its resources for its broader missions in recent years, which has allowed it to earmark funds for coordination. These inequalities cause problems if the resources do not allow each partner to ensure the mission they have assumed. 32The stakeholders in the partnerships often have a very heterogeneous background: administration, associations, social partners and sometimes ministers offices. This heterogeneity does not seem to be a problem, as indicated by the smooth functioning of the professional reference centres, with private entrepreneurs. Certain associations have proven to be more difficult: social partners and the administration are not in the habit of working together and function according to different operational approaches. The collaborative projects may also cause frustrations, and even the rejection of a stakeholder if the results do not meet the proclaimed operational objectives. 33The involvement of stakeholders is not continuous, but variable at different moments in an intervention, and an administration which is not involved initially in an intervention may go on to take on its leadership. The commitment of social partners or the support of ministers offices is not continuous and, for some, depends on support from federations and, for others, on the political agenda. Each intervention must be analysed in a diachronic perspective. 34In terms of respect and trust, if a stakeholder is recognised as being legitimate, based on its competences (policies or techniques) or the networks it is part of, the management of actions must allow its integration in the established partnership. The cooperation mechanisms implemented thanks to the actions of the New Deal (working groups, exchange of good practices, etc.) give rise to new dynamics of exchanges between stakeholders and thus increase trust in the dynamics of self-reinforcement. Institutional bottlenecks have persisted: the high expectations of the stakeholders interviewed regarding the involvement of education in concrete training and employment policies contrasts with the relatively peripheral position granted to CCFEE and BNCTO, key stakeholders of the education policy present in the territory of Brussels. 35Difference of authority, conflict of interest. Whether organisations are similar or different, the partnership dynamics are better if they feel that it would be beneficial to work together at their level. The lack of a common vision of the intervention may be due to a conflict of interest between stakeholders: power relationships, such as those observed with CESRBC, reflect a position of power which allows programmatic texts to be negotiated, such as the agreement, but due to their consensual character, do little to foster more operational collaboration, possibly leading to synergies. 36Internal leadership within the partnership is inter-organisational and must allow an integration of the different visions of partners in the objectives of the intervention and a joint organisation of a schedule. This function is essential to ensure the proper implementation of the partnership. The leadership is not necessarily assumed by the same stakeholder throughout the intervention. When the intervention stabilises and reaches a status of administrative management, the leadership is often provided by the partner with the greatest share of operational commitments. Tensions have been observed at co-leadership level: either because the two leaders fight for the responsibility of the project, or because neither leader accepts it. The experience of the New Deal shows that strategic co-leadership, shared between three ministers offices, including that of the Minister-President, the environment and employment, as well as the social partners, is not straightforward and operates with difficulty, as project responsibilities are not clear. In the case of professional traineeships (table 1) – an intervention which did not go well according to the stakeholders interviewed – tensions between partners emerged, hindering the operational leadership entrusted to social partners. 37In order to favour innovation, the method of governance must keep the choice of procedures relatively open to allow stakeholders to bypass certain bottlenecks which could prove to be transitional. Formalisation could take place later, when all of the stakeholders are ready to sign a formal agreement [Perry-Smith, 2003]. The stakeholders interviewed express the desire for actions to follow a timetable beyond electoral deadlines. 38The effectiveness of actions – even presumed – contributes to reinforcing the satisfaction and involvement of partners, which requires a reinforcement of communication regarding realisations in order to objectivise them and measure their scope and sustainability. 39The dimension of calculating the “cost-benefit” of the collaboration should be linked to the level of commitment of the partners. It turns out that the more a partner is committed, the more the partner benefits from the collaboration and does not question the cost of cooperation. Certain government officials underline the slowness of the process: “As operators, we have sometimes been disconcerted by the deadlines required for the beginning phases, which seem relatively long with respect to the duration of the project.” They explain this in part by the difficulty to implement integrated approaches, especially if they also require the involvement of community participants in charge of training. Despite the initial objectives of transversality, the first actions were still regional, as the community authorities initially were not associated with the agreement project. This delay at the outset reveals a certain institutional rigidity. 40Who must be the main beneficiary of collaborations implemented by the agreement? 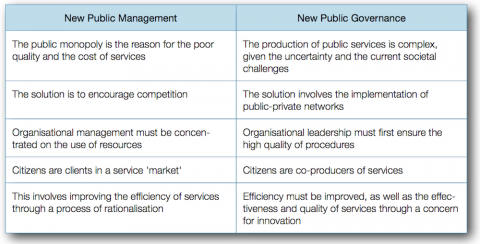 What are the stakeholders’ ideas of the target public? In order to preserve the coherence of the policy, it is preferable for the stakeholders involved in an intervention to have the same idea of the target public. Without a shared concrete vision of the target group, there is little chance that the partners will be able to target their intervention on a precise group to carry out a coherent project, as pointed out by various stakeholders interviewed for the professional reference centre “city professions”, where the partners have not succeeded in defining a common priority group. 42The informal personal networks are often presented as being particularly important for the proper functioning of the coordination processes of the New Deal. The contacts, discussions, and therefore informal coordination are highlighted regularly as a decisive mode of management for change, for removing certain bottlenecks and for establishing partnerships. Contacts count, as well as the informal circulation of information. The predominance of the informal aspects of partnerships makes the implementation of the agreement very dependent on the people involved. “Coordination is too informal, as everyone knows everyone in Brussels,” states one of the stakeholders of the social dialogue. This observation converges in different ways with the observation that the alignment of actions and strategies seems to depend greatly on the involvement of (certain) stakeholders, albeit beyond their formal mandate, specified in the New Deal. 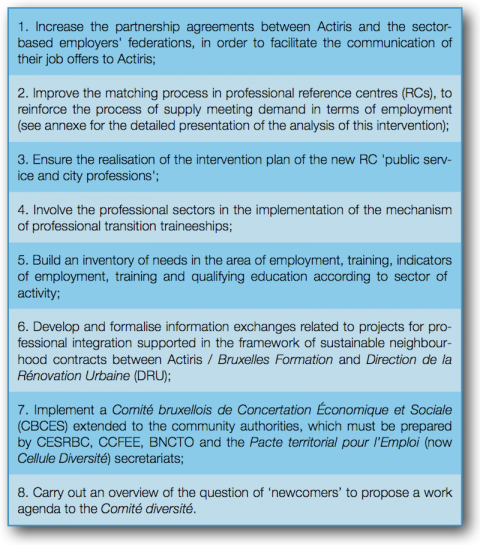 43This section proposes a reflective and prospective view of the results of the evaluation presented below: do these new modes of cooperation herald the emergence of new public governance in the Brussels Region? 44One of the key questions raised during the evaluation was the added value of coordination with respect to former methods of operation. The New Deal favoured the implementation of follow-up procedures as well as transversal methods of coordination which until then had not existed: project follow-up software, a reporting process within CBCES, the establishment of meetings between pilots of actions and a coordination unit (figure 1). The main administrations – on their own initiative or with the explicit support of the New Deal – have designated a reference person in charge of the coordination of the New Deal. The social partners also underline the fact that the New Deal has allowed the creation of new areas for cooperation with the members of administrations or ministers offices, by creating working groups in which the different stakeholders cooperate in a relatively informal way. According to a social dialogue stakeholder, there must be “positive communication […], not a distortion of figures, but people must be made aware of the benefits of collaboration and how collaboration can be successful”. These new methods of coordination have also allowed certain stakeholders to reinforce themselves and constitute an added value with respect to former methods of operation. For example, the cooperation between Actiris and social partners has increased, and the New Deal is not insignificant in this change: social partners have been able to make their demands known to Actiris in a less formal framework than its management committee. 8 Focus group, March 2014. 45Many examples of the reinforcement of existing cooperation have been observed. The cross-policy agreements, often presented as major progress made by the New Deal, concern administrations fundamentally (in particular Bruxelles Formation and Actiris), as the “armed wing” of the policies. The progress identified in the field (sometimes described as “Actiris and Bruxelles Formation finally on speaking terms”) is therefore without a doubt linked to political impetus, additional allocated means and changes of people at the head of administrations. The New Deal did not create cooperation but reinforced it. The improvement of cooperation between Actiris and Bruxelles Formation is explained by the implementation of new procedures and a weakening of institutional barriers, as well as by the increase in human and financial means: the “barriers are down”,8 according to a social dialogue stakeholder. This also implies that former methods of operation which prevented good collaboration have been left behind, as pointed out in various interviews. The evaluation of the key to progress therefore undergoes a shift from the availability of decision makers to “play the game”, i.e. from the impact of people as well as mechanisms. 46The irreversibility of actions taken and the appropriation of shared tools are signs of the sustainability of the dynamics used in the framework of the New Deal. For example, the decision to bring together the Brussels sections of the employment and training administrations should reinforce the new coordination, with a clear distance taken between VDAB Brussels and VDAB Vlaanderen in order to adapt to the specificities of Brussels. The commitments of the sixth state reform also improve the perspectives for the sustainability of the working hypotheses of this cooperation favouring a transversal approach to employment and training. 47The case analyses show that other transversal stakeholders emerge. In addition to the employment and training administrations, there are the policy-makers and the social partners. At political level, three governments which are active in the bi-community territory of Brussels intervene according to their respective competences with their specific political challenges. The social partners are also involved in the foreground of the New Deal, moving from a strategic level to an operational level of implementation. The involvement of the latter in the negotiations and drafting of the agreement is seen by the stakeholders as something very positive. However, their operational commitment is only moderately successful, among others due to their lack of experience in the area and – according to them – to their organisational structure which is poorly adapted to the implementation of public policy. They recognise their own limited capacity to truly engage the parties which they represent in operational matters. Contrary to the administrations directly subject to the authority of their political referents, the social partners have a margin for interpretation of the signed texts, and the implementation of commitments requires an appropriation of these commitments by their organisations or members. 49The New Deal does not clarify the complexity of the situation in Brussels. Few stakeholders are concerned about knowing who gives the keys to understanding the employment policy to job seekers and companies during their interventions. It is even difficult to show that the partners involved in an intervention have the same vision of the beneficiary group. More precisely, the Walloon and Flemish views are very different regarding the New Deal, and the stakeholders develop different perceptions of its effectiveness. 50In addition, the asymmetries in the division of community competences between Walloon and Flemish institutions have sometimes been neglected, causing certain tensions in partnerships. In the interviews with representatives from Flemish organisations, they expressed a true interest in the dynamics of the New Deal and a general wish to be integrated more in order to develop actions centred on the specificities of Brussels. As with certain social partners, an indirect stake may be identified: it allows a stronger assertion internally of an identity specific to the Brussels components. 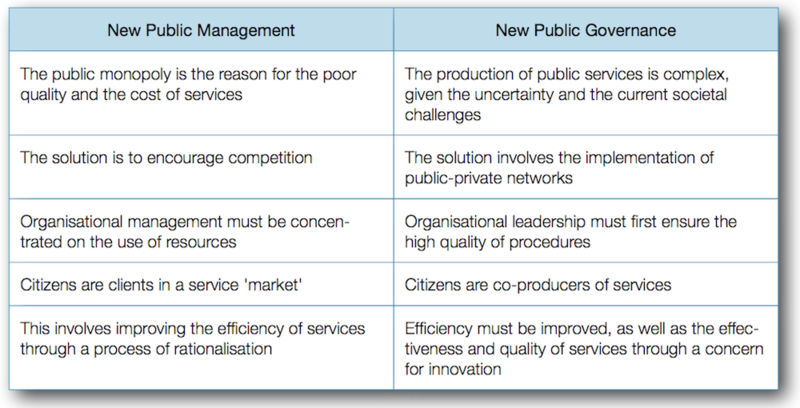 51The results presented until now also allow the conditions for a “network-based governance”, suitable for public innovation, to be set more broadly. This governance calls for operating no longer according to a managerial approach under hierarchical control, but according to a project logic [Sorensen et al., 2011] in keeping with the spirit of “new public governance”. As explained by Genard , due to the multiplicity of demands and the plurality of positions, social problems require more inventive solutions nowadays. 52Today, collaboration principles rather than competition principles are underlined (table 2): in order to manage increasingly complex and plural social policies, an integration of the different stakeholders must be ensured and the multiple guidelines must be considered, i.e. the models of perceptions and involvement in public intervention, supported by different groups in a diverse society. In this logic, the stakeholders gather resources, develop new ideas and practices together and perspectives which could not have emerged without a collaboration, while contributing to reorientating the practices of all of the stakeholders concerned. 53It is important to present the partnerships supported by the New Deal with respect to this approach to innovation which – faced with complex and transversal problems – proposes the implementation of cooperation processes open to stakeholders. Such an initiative involves relatively fast dynamics (to obtain results from the beginning of the project), in an iterative logic (the solution is evaluated and questioned by the participants). While the general principles of this type of method of public governance are followed by the participants of the agreement, their operational translation remains to be formalised. The stakeholders are still struggling to associate institutionally peripheral stakeholders. 55How can the effectiveness of the coordination be reinforced? Is it possible to define a public policy under such auspices? A project management logic does not seem to have been planned at the outset of the agreement: “The piloting mechanism did not exist and had to be developed later.” “Coordination was implemented on the job,” states a minister’s office adviser. Many proposals have already been made to reinforce the management of the New Deal, by clarifying the strategic orientations and by defining the management methods, ensuring an effective professional commitment on behalf of the different partners. 9 Each step of the intervention is taken into account in a specific manner. 11 In other words, associating the different stakeholders concerned with the objectives of the policy. 56At present, this involves developing a coordination model which allows the management of actions which is sequential,9 strategic10 and integrated.11 In this innovative process, options must remain open in order to leave the necessary space to pursue new processes of collaboration. There must be a certain flexibility from the start as well as enough autonomy, given that no one knows in the beginning what will work. For each intervention, realistic resources must be provided, requiring a clarification of all of the mandates and responsibilities. Next, if the dimension of education constitutes a priority within the agreement, an association of the stakeholders concerned must be ensured from the start, when the objective of the stakeholders is defined. It is also important, during the progress of the intervention, not to lose sight of the final beneficiaries in order to ensure coherence with the strategic objectives announced in the agreement. A system of professional project management is therefore essential. 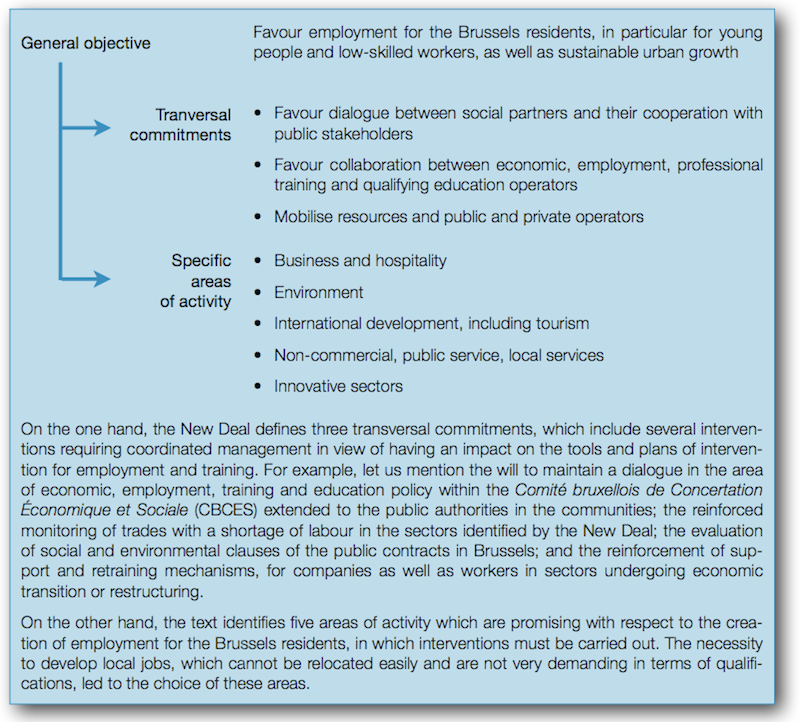 57The transversal evaluation of the New-Deal is a first in the Brussels-Capital Region. Co-produced by a team of researchers and BISA, it is the sign of a change in the Brussels Region. With the New Deal, the Region established a unit as part of BISA, in charge of evaluation missions, in a logic of rigour and openness, both professional and transparent, integrating international criteria in the area of public policy evaluation. This implies continued development of a culture of evaluation in the years to come. 58The evaluation of the effectiveness and the efficiency of cross-collaborations developed in the New Deal, likely to go beyond the political and institutional fragmentation in Brussels in the area of employment and training, had the objective to take stock of the functioning of partnerships – and not to confirm that the partnerships were improving access to employment for the Brussels residents – given the lack of time between the moment the actions were implemented and their evaluation. 59Emblematic of the emerging form of “network-based governance”, the New Deal is the first transversal mechanism evaluated. The development of partnerships as an instrument of convergence is not new, but the working method of the New Deal is original at Brussels level due to the type of stakeholders involved. For the first time, the Government and the social partners in Brussels were involved on an equal footing to implement a limited number of actions. These traditional strategic stakeholders, with no hierarchy between them, had to work together to operationalise these actions – a traditional role of administration. 60By defending the transversal approaches, favouring the cooperation between different stakeholders and getting round the institutional and territorial divisions, this Agreement has contributed to putting to the test the specialised “silo” structuring of public administration and policies. It invites all of the partners to develop coordinated responses to political problems, beyond their reference and logic of intervention. 61The results of the evaluation show limits to this flexible coordination approach. The transformations targeted by the New Deal in the governance between Brussels stakeholders, marked by the will for the transversality of public intervention and by the development of a shared interpretation of the employment problem, in the end remain limited by the institutional division which it claims to transcend. The search for a compromise has also been hindered by the stakeholders’ concern to maintain control of their instruments. 62The coordination method would benefit from reinforcement in order not to be reduced to a juxtaposition of stakeholders. The function of leadership in a non-binding mechanism – an aim of the New Deal – is essential to create dynamics and be sure of the progressive construction of actions contributing to the general objective to favour employment in Brussels and the employment of the Brussels residents. In order to strengthen the partnerships, the level of involvement of stakeholders must also be defined according to their means of intervention. 63In the current institutional context, these results invite stakeholders to take the opportunities offered by other instruments, going further than this form of non-binding coordination. The transfer of competences to federated entities, ratified by the sixth state reform, thus opens new avenues to be explored. As the keys to employment are in the hands of these entities, they may take this occasion to commit to converging objectives and go beyond competition between stakeholders. ABMA, T.A., STAKE, R.E, 2001. Stake’s responsive evaluation: Core ideas and evolution. In: New Directions for Evaluation. 2001. Volume No. 92, pp. 7‑22. ALBARELLO, L., 2011. Choisir l’étude de cas comme méthode de recherche. Bruxelles: De Boeck, Collection Méthodes en sciences humaines. BLAISE, P., SÄGESSER, C., 1999. Le Conseil économique et social de la Région de Bruxelles-Capitale. In: Courrier hebdomadaire du CRISP. 1999. Vol. 1999/1, No. 1626‑1627, pp. 1‑83. CLAISSE, F., JORIS, G., 2013. Le projet SCoPE, la construction de l’action publique en univers incertain : l’Open Process Workshop comme technique participative. In: BRUNET, S., CLAISSE, F., FALLON, C. (dir. ), La participation à l’épreuve. Bruxelles : Peter Lang, Méthodes participatives appliquées/Applied participatory Methods, Vol. 3, pp. 73‑84. GENARD, J.-L., 2009. Réflexions sur la gouvernance de la Région de Bruxelles-Capitale. In: DEJEMEPPE, P., MOUCHART, C., PIERSOTTE, C., RAYNAUD, F., VAN DE PUTTE, D., Bruxelles [dans] 20 ans. Bruxelles : Agence de Développement Territorial (ADT), Cahier de l’ADT, No. 7, pp.163‑183. IBSA, SPIRAL. CIPRIANO, S., FALLON, C., FASTRÉ, P., HALIN, J., 2015. Évaluation des actions transversales du New Deal bruxellois. In: Les Cahiers de l’IBSA, Institut Bruxellois de Statistique et d’Analyse (IBSA). Mars 2015, No. 4. IBSA, Cellule New Deal. CIPRIANO, S., GANGJI, A., GRIPPA, I. 2012. Dossier : New Deal bruxellois. In: Baromètre conjoncturel de la Région de Bruxelles-Capitale, Institut bruxellois de Statistique et d’Analyse. Avril 2012. No. 23, pp. 30‑44. IBSA. MICHIELS, P.F., 2014. Marché du travail et revenus des ménages à Bruxelles : quelle évolution à moyen terme ? In: Focus de l’IBSA, Institut Bruxellois de Statistique et d’Analyse (IBSA). Février 2014. No. 2. HERTTING, N., VEDUNG, E., 2012. Purposes and criteria in network governance evaluation: How far does standard evaluation vocabulary takes us? In: Evaluation. Janvier 2012. Vol. 18, No. 1, pp. 27‑46. KREUTER, M. W., LEZIN, N. A., YOUNG, L. A., 2000. Evaluating Community-Based Collaborative Mechanisms: Implications for Practitioners. In: Health Promotion Practice. Janvier 2000. Vol. 1, No. 1, pp. 49‑63. LASKER, R. D., WEISS, E. S., MILLER, R., 2001. Partnership synergy : a practical framework for studying and strengthening the collaborative advantage. In: Milbank quarterly. Juin 2001. Vol. 79, No. 2, pp. 179‑205. NASSAUX, J. P., 2012. Les aspects bruxellois de la réforme de l’État du 11 octobre 2011. In: Courrier hebdomadaire du CRISP. 2012. No. 2129‑2130, pp. 5‑61. NASSAUX, J.P., 2011. Le nouveau mouvement bruxellois. In: Courrier hebdomadaire du CRISP. 2011. No. 2103‑2104, pp. 5‑88. PERRY-SMITH, J. E., SHALLEY, C. E., 2003. The social side of creativity: A static and dynamic social network perspective. In: The Academy of Management Review. Janvier 2003. Vol. 28, No. 1, pp. 89‑106. SIMOULIN, V., 2003. La gouvernance et l’action publique : le succès d’une forme simmélienne. In: Droit et société. 2003. Vol. 2003/2, No. 54, pp. 307‑326. SORENSEN, E., TORGING, J., 2011. 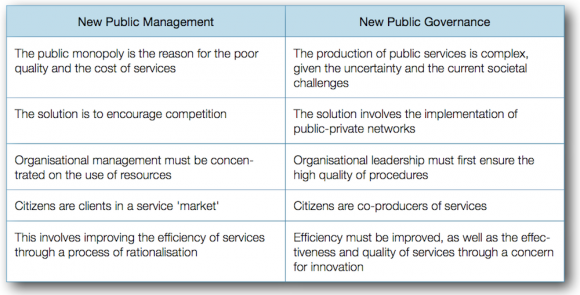 Enhancing Collaborative Innovation in the Public Sector. In: Administration & Society. Novembre 2011. Vol. 43, No. 8, pp. 842‑868. SORENSEN, E., TORGING, J., 2013. Enhancing Social Innovation by Rethinking Collaboration. Leadership and Public Governance. In: Conference Social Frontier. London. 15 novembre 2013. THYS, S., 2009. Réalités et défis de l’emploi et du chômage en Région de Bruxelles-Capitale. In: DEJEMEPPE, P., MOUCHART, C., PIERSOTTE, C., RAYNAUD, F., VAN DE PUTTE, D., Bruxelles [dans] 20 ans. Bruxelles : Agence de Développement Territorial (ADT), Cahier de l’ADT, No. 7, pp. 297‑321. WEISS, E. S., ANDERSON, R. M., LASKER, R. D., 2002. Making the most of collaboration : exploring the relationship between partnership synergy and partnership functioning. In: Health Education & Behavior. Décembre 2002. Volume 29, No. 6, pp. 683‑698. The data gathered from documents and individual interviews were analysed with respect to the dimensions listed in the theoretical framework of the study of a partnership, presented in figure 3. This empirical approach is illustrated below for one case. Objective of the intervention: The intervention is aimed at improving the circulation of information on the job offers collected in RCs and the identification of the skills of job seekers. It is also aimed at reinforcing the coordination between RCs. Stakeholders involved: The New Deal has entrusted the implementation of the intervention to Actiris and the minister’s office of the Brussels employment minister. The implementation of the intervention also requires the involvement of RCs. These non-profit associations are the fruit of partnerships between stakeholders in the area of employment, professional training and professional federations whose members are confronted with a need for skilled workers. The RCs are co-financed in equal proportions by private and public resources. Their boards of directors are presided over by social partners in the sector concerned and are made up in particular by representatives from Actiris, Bruxelles-Formation, VDAB-RDB, and the minister’s office of the Brussels employment minister. develop technical and educational expertise to adapt training to the changing economy. The new matching procedure implemented in the framework of the New Deal reinforces the partnership between Actiris and the RCs by organising in a coordinated manner the selection of job seekers, the identification of their skills and training needs, in connection with the job offers. The RCs provide Actiris with some of the evaluators and explain the required qualifications. Actiris sent some of its staff to the RCs in order to reinforce collaboration with them and assist them in these approaches to the screening of skills. Furthermore, the structure of its internal organisation corresponds to that of the sectors of activity covered by the RCs. 1. Resources: The New Deal favoured a reinforcement of the matching process of the RCs through the commitment of a full-time equivalent (FTE) in each RC. A FTE for a coordinator of the RCs works at Actiris and on the board of directors of each RC. The RCs are very different, as the sectors covered by them are specific. Certain sectors (e.g. construction) encourage employers more to invest in research and training. The RCs are encouraged to exchange good practices thanks to the support of the coordinator. 3. Involvement: The partners of the RCs seem to be relatively committed, but the level of involvement seems to vary according to the support from the professional sector concerned and the financial and human means which the RCs are able to take on. 4. Respect and trust: The relations between partners seem to be good and the feeling of trust was reinforced following the New Deal. The RCs began to exchange good practices: “[The person in charge of the economic sector] met the other RCs […], which also happened in the framework of specific contacts. For example, this morning there was a staff meeting. There is a [public] company which will hire drivers with C licences, but they won’t do it with the recruitment consultant from the [RC City Professions] public institutions centre […]; they will do it through the Transport & Logistics RC because they have the tools.” The smooth collaboration between the partners, upstream from training (information, orientation) as well as downstream (proposal of quality job offers, research and integration in the labour market) influence the effectiveness of the measure in a positive way. A personalised relationship is established between the companies and the RC staff. 5. Difference of authority, conflict of interest: The partners are very different, but the interviews did not indicate the existence of any problems in the area of coordination. 6. Internal leadership: This aspect was reinforced by the New Deal, thanks to the commitment of the RC coordinator who manages the implementation of the matching process, with the staff from Actiris planned for each RC. This coordinator has a certain level of autonomy and handles the piloting. 8. Governance: The management of RCs is supervised by the RC coordinator. In order to do this, she sits on the boards of directors of RCs. She develops activities on a daily basis with the RCs. The transversality of the coordination is reinforced by the fact that only one person is in charge of relationships with the RCs. 9. “Cost/Benefit” of the collaboration: It appears that the collaboration on the matching process is necessary and profitable between the stakeholders. The RCs approach Actiris which sends job seekers to them, allowing better knowledge of the offer of skilled workers in these key sectors. For its part, Actiris receives support from the RCs for training job seekers, carrying out technical and professional skills tests and skills validation tests, and integrating them in the labour market. 10. Idea of beneficiaries: The people who are active in the RCs and in the Actiris departments concerned are close to the field and are in contact with their public. There are two beneficiaries identified for this intervention: employers and job seekers. 2 For further information on the specificity of the regional situation in Brussels in the area of social dialogue and the special status of the Conseil économique et social de la Région de Bruxelles-Capitale, see Blaise et al., 1999. 3 Agence Bruxelloise pour l’Entreprise (ABE), Société d’Acquisition Foncière (SAF), Agence Bruxelloise pour l’Énergie (ABEA). The other acronyms are presented in figures 1 and 2. Sabrine Cipriano has a degree in economics and an inter-university certificate in the evaluation of public policies. After working at IWEPS where she participated in the evaluation of the Marshall Plan, in 2011 she joined the Brussels Institute for Statistics and Analysis (BISA). She is responsible for the public policy evaluation unit, and in 2013 and 2014 carried out an evaluation of the Brussels New Deal, presented in BISA Cahier No. 4 (available at www.ibsa.irisnet.be). Catherine Fallon is a civil engineer and has a doctorate in political and social science. She is currently a lecturer in the political science department at Université de Liège, in the area of public policy evaluation and risk governance. She directs the SPIRAL research centre, specialised in qualitative methodological research and the study of interactions between science and society. She supervised the evaluation of the New Deal, carried out in 2014 for BISA. Perrine Fastré has a master’s degree in economics from Université Libre de Bruxelles and an inter-university certificate in the evaluation of public policies. In 2012, she joined public policy evaluation unit of the Brussels Institute for Statistics and Analysis (BISA). In this framework, she participated in the evaluation of the Brussels New Deal and contributed to writing BISA Cahier No. 4. Jordan Halin has a degree in political science and public administration from Université de Liège (ULg). He is currently in charge of research at the SPIRAL research centre in the political science department at ULg, where he carries out evaluations of public policies. He took part in the evaluation of the New Deal, carried out in 2014 for BISA.